Just over six months ago, Corsair launched the first closed-loop liquid cooling solutions that use the 6th Generation of Asetek’s cooling technology. The two new models introduced were the H150i Pro, a 360mm closed-loop liquid cooling solution for $159.99 and then the smaller H115i Pro 280mm liquid cooler at $129.99. Both of these liquid CPU coolers use Asetek Gen6 pump and coldplate technologies and have been kitted out with the latest Corsair Magnetic Levitation fans (ML-series) and RGB LED lighting powered by CORSAIR iCUE software. 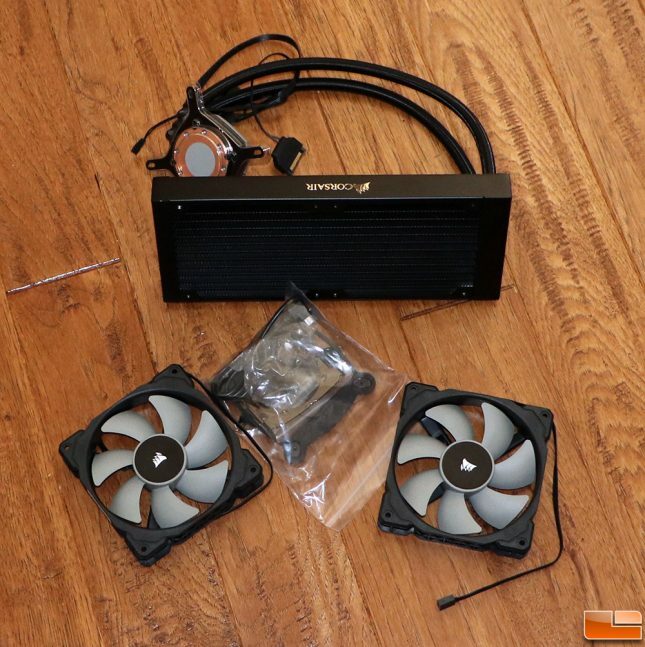 Corsair also introduced a 0RPM mode for these two new coolers, so if liquid temperatures are below 45C the fans turn off and you can enjoy near silent cooling as the pump must still circulate the coolant. Cooling performance on water coolers has really plateaued in recent years, so most the advancements these days are on the cooling solutions pump and fan acoustic performance as well as visual appearance. These two coolers have proven to be good units for those that what to run a 280mm or 360mm radiator. Those that have a case that won’t support coolers that large have been missing out on the latest cooling technology until today. Just moments ago, CORSAIR launched the Hydro Series H100i PRO 240mm Liquid CPU Cooler for $119.99 shipped. It has all the same key features of the H115i PRO RGB and H150i PRO RGB, but in a smaller package at an even lower price point. Dynamic Multicolor RGB Lighting: Vibrant RGB LED pump head produces vivid lighting effects to match your build. Powered by Magnetic Levitation: Two 120mm ML Series magnetic levitation PWM fans deliver incredible airflow and static pressure at low noise levels. Total Speed Control: PWM fan-speed control allows you to run your fans anywhere between 400 RPM to 2,400 RPM for complete quiet or maximum cooling. Powerful Software: CORSAIR iCUE software allows you to control your cooler’s RGB lighting and monitor CPU and coolant temperatures, and adjust fan and pump speeds, all from a single intuitive interface. Zero RPM Mode: Zero RPM cooling profiles allow fans to stop entirely at low temperatures, completely eliminating fan noise. Easy to Install: Modular, tool-free mounting bracket for quick and painless installation on most major CPU sockets. Inside the retail packaging you’ll find the Corsair Hydro Series H100i PRO Low Noise 240mm RGB Liquid CPU Cooler, mounting kit, two ML Series PWM 120mm high performance fans, USB cable for CORSAIR iCUE Integration, fan and radiator mounting screws and a quick start guide. The H100i PRO comes with mounting kits for every CPU socket over the past decade with the exception of the AMD TR4 socket used on Ryzen Threadripper processors. 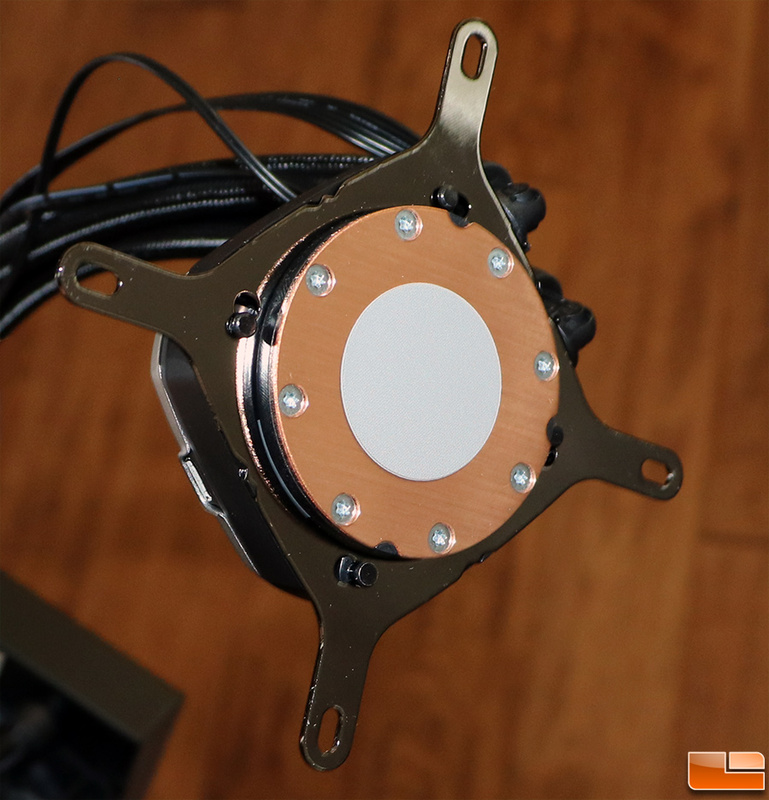 If you want to use this cooler on a Threadripper CPU you’ll need to purchase the AMD TR4 bracket from Corsair as an optional accessory. Corsair just introduced the TR4 Mounting Bracket Kit this month for the H100i PRO/H115i PRO/H150i PRO and it runs $9.99 plus shipping. Today we’ll be trying out the Corsair H100i PRO against the H115i PRO and the much older Corsair H105. The Corsair H105 came out in 2014 and uses Asetek Gen4 block/pump technology. We have a handful of these coolers and the 240mm radiator is extra-thick at 38mm and the dual Corsair SP120L fans move 73 CFM of air, which is enough to cool all mainstream processors. The H105 has been the workhorse on our test benches here at Legit Reviews for years, but we were were curious what we were missing out on. How things have progressed over the past four years? 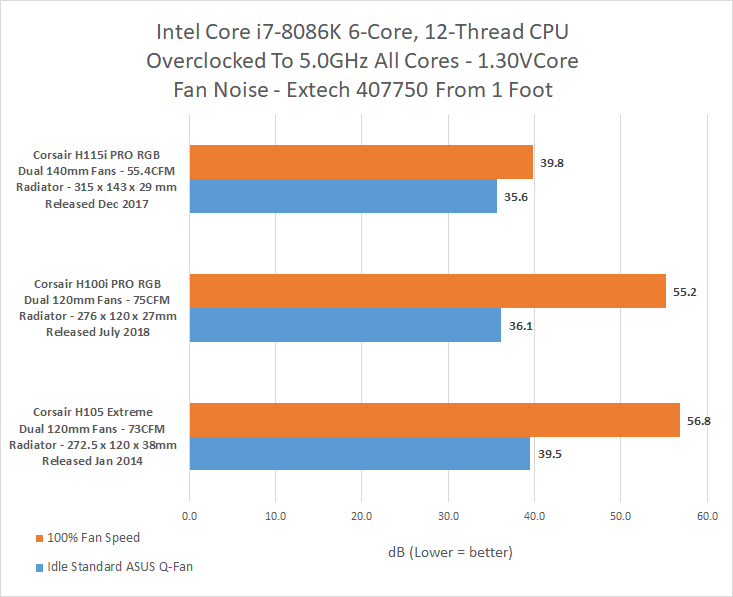 For that we turned to our Intel Core i7-8086K processor that we have currently overclocked up to 5.0 GHz on all cores on the ASUS ROG STRIX Z370-F Gaming Motherboard ($194.99 shipped) with UEFI 1002. We manually lowered the CPU core voltage to 1.30V as leaving it on auto would cause thermal throttling with the CPU multiplier increased to 50. The 16GB (2x8GB) DDR4 memory kit was running at 3200 MHz with CL14 timings and we were running Windows 10 64-bit on a Samsung SSD 970 PRO 2TB PCIe NVMe SSD. We tested all three CPU coolers with the fans and water pump running at 100% for load. When we tested sound levels we took idle measurements with the fans plugged into a header that had ASUS Q-Fan set to standard. Ambient temperature in the room for testing was 78F, plus or minus a degree. Room temperature was monitored throughout testing. When it comes to temperature performance the idle temperature of the Intel Core i7-8086K running at 800MHz had all the CPU coolers tested sitting within a degree of one another. We ran the AIDA64 stress test for 30 minutes to get our load temperatures. We found the new Corsair H100i Pro to be about half a degree cooler than the H105, which is pretty impressive considering the radiator is 11 mm thinner and the airflow (CFM) is basically the same. 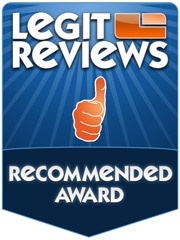 The Corsair H115i PRO bested the H105 by a full 2C at load and we expected that. 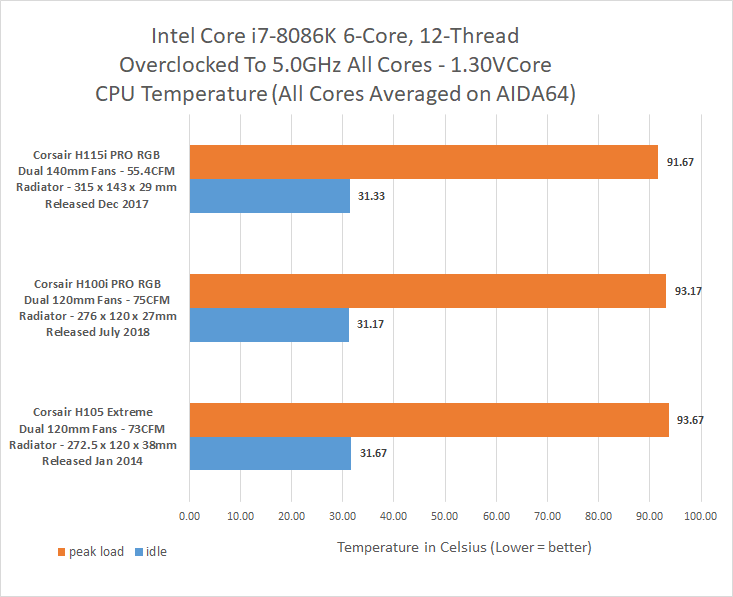 Cooling performance was slightly better on the H100i PRO and H115i PRO over the 4-year old H105, but the biggest difference was in the noise category. Wow! The difference between running the Corsair H105 fans at 100% (Corsair rated 37.7 dBA at 2700 RPM) and the newer H115i PRO (Corsair rated 20.4 dBA at 1200 RPM) was flat out amazing at both idle and load. We dropped the sound level by 17dB and load and nearly 4dB at idle when going from the H105 to the H115i Pro. The Corsair H100i PRO was most certainly quieter, but not nearly to the degree of the dual 140mm fans on the H115i Pro. The dual 120mm fans on the Corsair H110i PRO are rated 37 dBA at 2400 RPM and our testing showed they were about 1.6 to 3.4 dB lower than the Corsair H105. Corsair now offers Asetek Gen6 cooling technology in 240mm, 280mm, and 360mm radiator sizes. The addition of the Corsair Hydro Series H100i PRO cooler brings the latest in cooling technology and bold RGB styling to a wider audience. This all-in-one closed loop cooler has two Corsair 120mm ML Series magnetic levitation PWM fans, a slick looking RGB LED pump head to ensure your rig looks amazing and support for iCUE software that allows you to control everything. The H100i PRO’s pair of Corsair ML120 have a minimum fan speed of 400 RPM and can spin all the way up to 2400 RPM. This fan speed is well over the 1600 RPM ceiling on the from the ML120 fans included with the H150i PRO 360mm cooler and the 1200 RPM top speed on the ML140 fans included on the H115i PRO 280mm cooler. This makes the H100i PRO the loudest of the group, but it’s still quieter than older models like the Corsair H105. When it comes to performance the Corsair H110i PRO had impressive idle and load temperatures as we were able to best the Corsair H105 with a radiator that was 11mm thinner. The Corsair H110i PRO packs a mean punch for such a small unit and it’s the lowest cost model for the latest Corsair water cooling units. 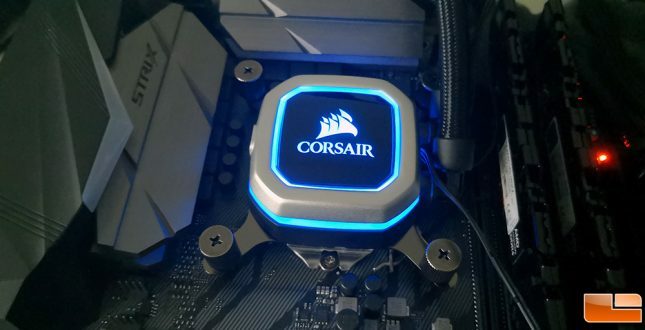 Corsair backs the Corsair Hydro Series H100i PRO with a 5-year warranty. Competitors in the water cooling market have widely varying warranties and it is something to consider. AeroCool backed their water coolers with just a 2-year warranty, but then you have the NZXT Kraken water cooling series that is backed by a lengthy 6-year warranty. Corsair is on the longer side when it comes to warranty length. We have Corsair water coolers that are over 10-years old that still run fine! Dethe new Corsair H100i PRO is ready to cool current and future CPUs for years to come. 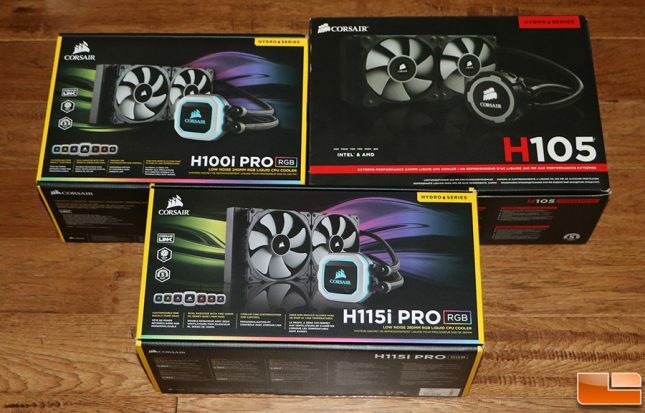 The H150i PRO and H115i PRO are available for $10 less than their MSRP, so we expect the same to be true on the Corsair H100i PRO once they have been on the market for a bit. This is an impressive cooler and aggressively priced against other 240mm All-in-One liquid coolers like the NZXT Kraken X52 ($132.00) and AeroCool P7-L240 ($119.99). Legit Bottom Line: The Corsair Hydro Series H100i PRO raises the bar for what one should expect from a 240mm cooler and it might be time to upgrade your old liquid cooler to something quieter with RGB lighting.